Home » Blog Home » New and Improved Browsing! You may have noticed the Tales2go desktop player looks a little different. 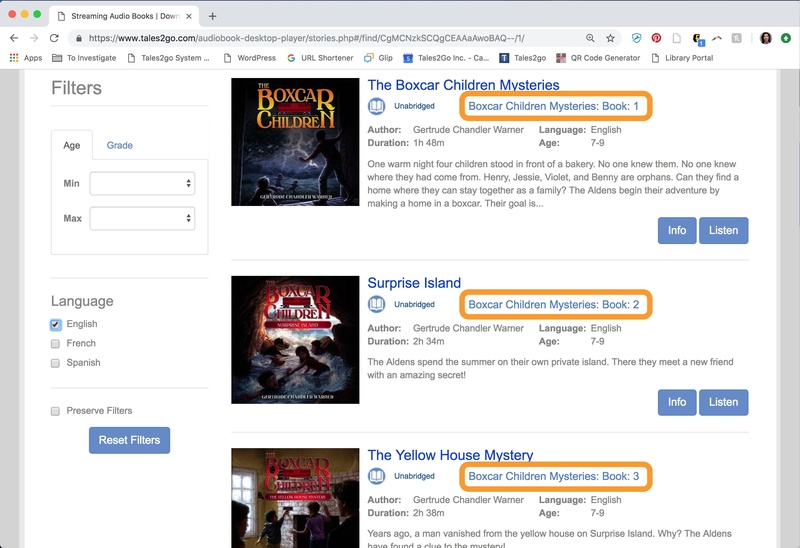 We're so excited to introduce you to the new and improved browsing structure that will help you find titles faster and easier! This development has been a long and thoughtful project, based primarily on feedback and suggestions we received from all our subscribers. In this post, I'll give you a quick introduction to the new features, but we hope you'll log in and experience all the shiny newness for yourself! 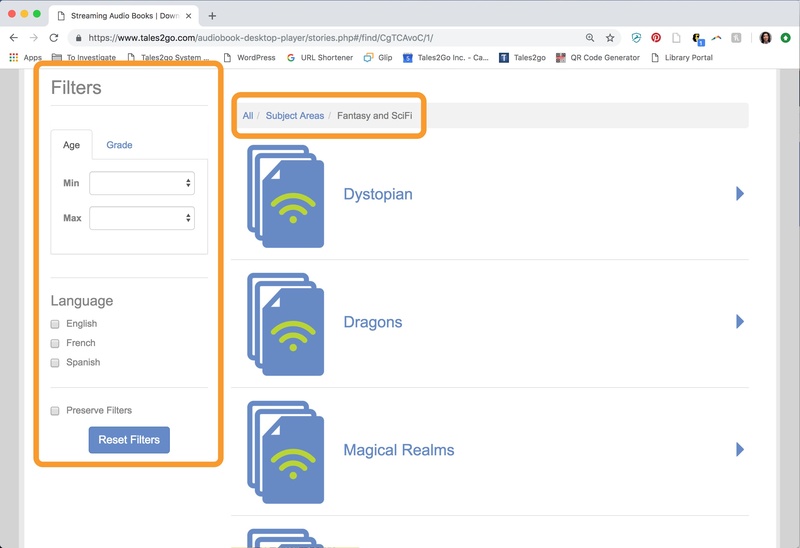 If you'd like a printable overview of these new features, scroll to the bottom of this post for an instantly downloadable pdf. Some things are better together. 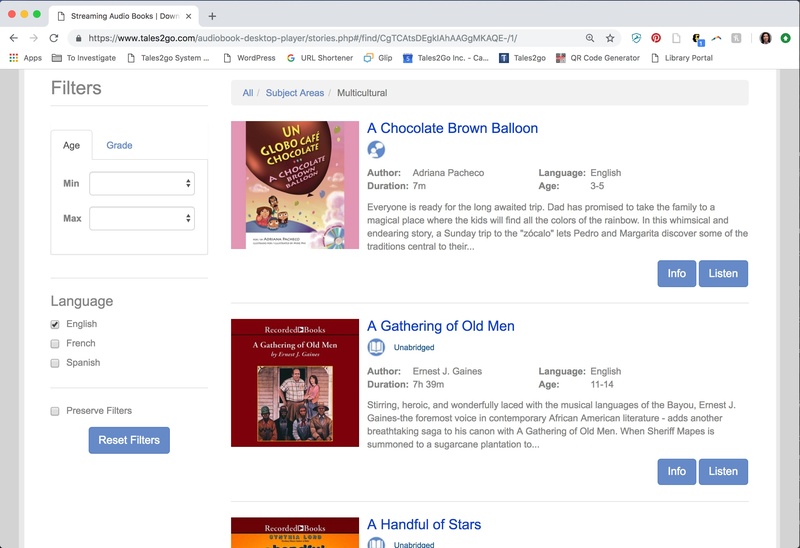 Now you can browse the library, but narrow your results with filters, so you can find titles more quickly and easily. Narrow your results as you explore the library. 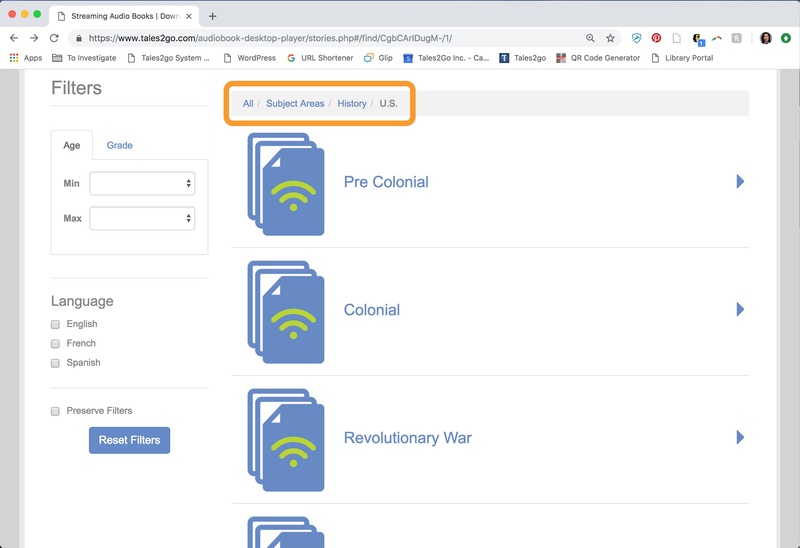 If you're looking for a US History title, you can now browse just that section. Within US History, you'll see that titles are further sorted by event or time period. 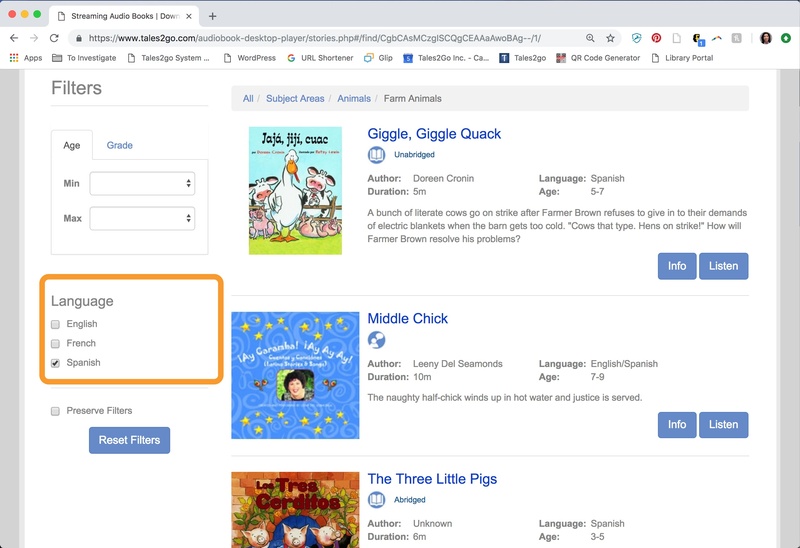 As we continue to add more foreign language titles, you may want to search for titles in one or more particular language. Now you can include or exclude exactly the languages you want. Some series of books are quite large - and growing! Fans of the Boxcar Children Mysteries, for example, will be happy to see that books are now ordered by their number. This way, if you're listening to book #47, you can quickly find #48. One of the benefits of digital audiobooks is that they can be in two (or more!) places at the same time. 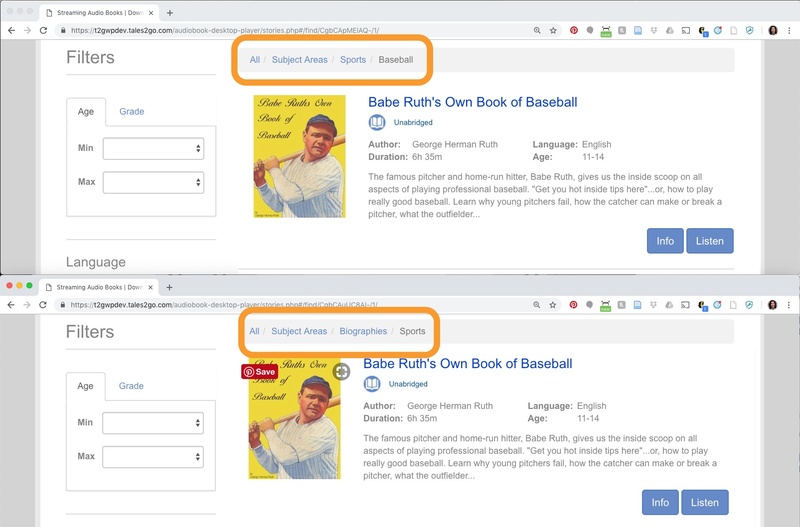 If you're looking for Babe Ruth's Own Book of Baseball, you'll find it by going to Subject Areas > Sports > Baseball and Subject Areas > Biographies > Sports. We know that students need windows and mirrors to connect and enjoy their stories. The new multicultural section (under Subject Areas) aims to help you and your students find the right mirrors and windows. Now you've read all about the new features, go check them out! All the same great content is there (with more on the way! ), and we hope that it's now easier for you to find just what you're looking for. Click here for a pdf overview of these features that you can print or email to spread the word.